Alternatively, you can Clone the GitHub repository. 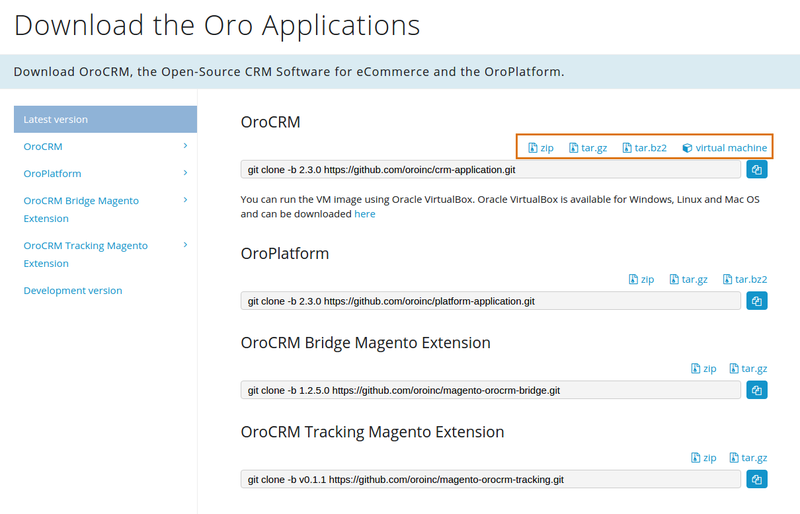 Download the latest version of the application from the download section on oroinc.com/orocrm. Click the zip, tar.gz, or tar.bz2 link to download the archive. Download the virtual machine to quickly deploy the application in the virtual sandbox environment. The directory you extracted the files to, will be used in the following steps and will be referred to as [$oro_installation_folder] further in this topic. Unlike when downloading from the GitHub repository, you are not prompted to enter the configuration parameter values. Default values are used instead. If necessary, update configuration parameters in the app/config/parameters.yml file after the command execution is complete.